During the night, our tent flapped furiously as it responded to the wild beckoning of the wind howling amongst the treetops. 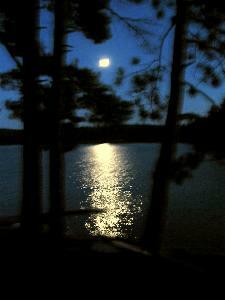 Waves lapped against the shore and spruce limbs swayed and creaked against each other – sleep did not come easy. We arose to a surprisingly peaceful morning and went about our morning routine. Before departing, Norm skipped flat beach stones across the still lake, and watched multi-oval ripples shimmer and widen among the shafts of flaxen sunlight. Ah, to be a boy again! By 8 am our gear was unloaded at P4L1470 (205 to 189); the trudge up the steep, washboard incline seemed endless. By the time we covered one-third of the portage, our thighs burned and we looked forward to a leisurely walk back for the second load. The region is renown for its relentless weather patterns and this kept us on the alert. Distant thunder sounded in the eastern sector of the park and a gentle, cool breeze crept upon us without any warning. Through the treetops, dark clouds broiled and a real douser of a storm was anticipated. 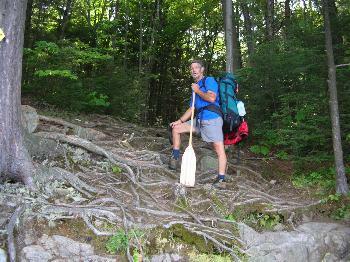 We quickened our pace and completed this demanding portage in three segments. Midway across Kakakise Lake, we noticed clusters of puffy cumuli clouds spreading fast over the eastern horizon – to us, this meant unstable air masses. Thunder grumbled more frequently and the wind shifted, now blowing ominously in from the northeast - an obvious weather warning. The shoreline at P5L940 (189 to 207) provided limited space for stowing our gear due to the sharp rise of entangled pine roots and rock ledge. Extra care was taken while pushing, pulling and hauling our canoe over this obstacle up to a higher, level terrain. The first segment of the portage was brutal, our legs straining to climb over snake-like roots, rocks and ruts on an incline that was steeper than the previous portage. We tough slogged it to the height of land at the halfway mark; our sense of accomplishment was short-lived as we hurriedly covered our backpacks with a tarp, in preparation for the downpour during our return trek for the remaining equipment. In spite of the prominent muffled sound of thunder on route, an eerie oppressive silence dominated the woods. As we descended the steep gradient trail to the shoreline of Kakakise Lake, we were greeted with a sudden flash of lightning and a roar of thunder, followed by an immediate downpour. The storm was directly overhead at that point. Soaked to the skin, we quickly took cover under our large tarp and watched the raindrops intensify and smote the lake’s surface flat. After a twenty-minute repose, the rain showed no sign of abating. Already wet from sweat and rain and not getting anywhere by sitting under a tarp, we decided to continue portaging. In preparation for this storm, the backpacks were placed upside down in individual garbage bags. When readied for transporting, slits were made in the bags so the straps passed through; this way, the backpacks were always kept dry. The wet terrain demanded additional diligence and care in where and how we took each step. This was not a time to be in a hurry and risk an accident. The storm blew itself out within the hour of our arrival to the end of the portage. 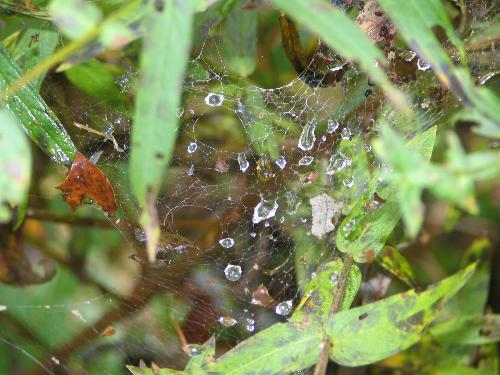 Among the branches, trapped raindrops sparkled on the filaments of spider webs and an exotic scent of ripe coniferous trees wafted around us - there appeared to be a tranquil, unhurried feel to the place. Carlyle Lake, small in width with a maze of coves and inlets, allowed us to saunter through narrows and around points before entering the open expanse of the lake. A huge blown-down coniferous lay slanted along the edge of campsite 62, with its top deep into the woods and its massive circular root system exposed to passing canoeists. A park sign attached to a tree indicated that the site was closed for safety reasons. It was assumed that the tree either fell as the result of a terrific windstorm or just got tired, no longer able to hold onto the sparse soil on the rock surface. Several private cottages, situated outside the eastern boundary of the park, came into view. Between Carlyle and Johnnie Lakes, we meandered through a valley of wetland dotted with beaver houses, stumps, a mass of lily pads, and nesting ducks unconcerned with our passing. It was an ecosystem where one easily became lost in time. 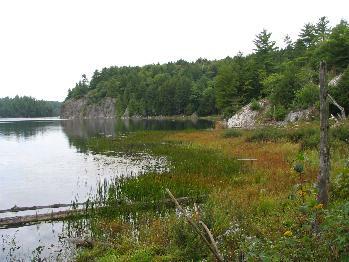 At Johnnie Lake access, a canoeist informed us that Bell and Johnnie Lakes had been hit hard by a thunder and lightning storm prior to our arrival – we were fortunate to have been on its fringe. There was still a smell of rain in the air and low-lying gray clouds gave support of another incoming rainfall. We retrieved our raingear and once again, covered our equipment with a tarp before setting out. At the end of the lake, winds pounded a rain-burst relentlessly against the skylight and in no time, we were in the middle of a black squall. The wind tore at our raincoats, trying desperately to open our shell of protection. Raindrops pelted the lake and turned the water’s surface the texture of a gravel road. We slipped under a gust to get close to a nearby beach and debark safely, taking refuge under the shelter of a huge coniferous while waiting out the storm, cold and shivering. Raindrops continued to splay upon the lake surface as we paddled into a hard drizzle, occasionally squinting down a long reach towards our destination. Then the blue sky, resembling a jagged tear in the clouds, appeared and allowed the sun to emerge and cast its warmth. Beyond the tree line and portage to Ruth Roy Lake, the top of a higher ridge became visible – we would be camping there on our return at the end of the week. A row of outfitter chalets stood silent as we passed through a shallow, our paddles occasionally striking underlying rocks and logs. A segment of the Silver Peak range welcomed our arrival, and our excitement escalated with the knowledge that in two days we would be hiking to its top. As a cool wind picked up, we were eager to locate our campsite in order to change into dry clothes and cook a warm meal to quell our hunger. 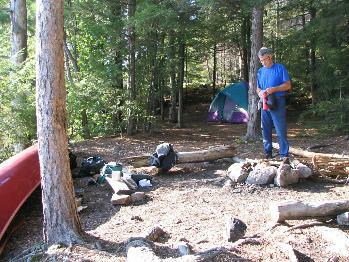 Campsites 64 had a great tent pad, an ideal fire pit, an area for a clothesline and a tree limb to hang our food bag. 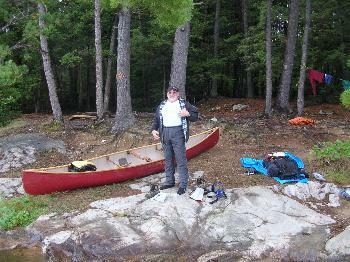 We used the canoe as a "backlog" to block the wind during the cooking of our supper. 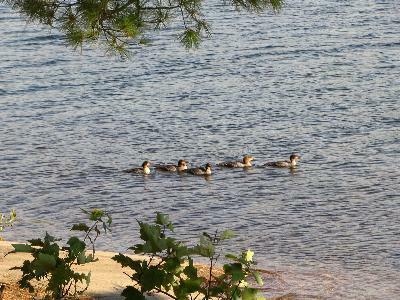 A flotilla of redheaded mergansers scurried by our campsite, unperturbed by our presence as we sat on a rock at the water’s edge. 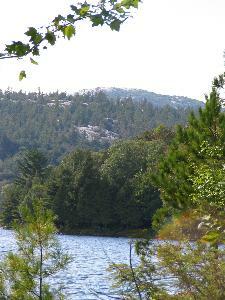 Between the two campsites, a slab of grey rock stood high out on a jutting point, resembling a whale’s back. The evening sun probed the remnant clouds for an opening to cast its orange patchwork glow over the drenched landscape. 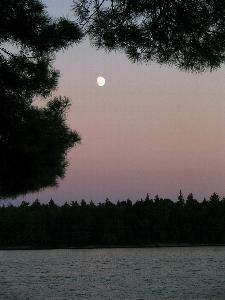 That night, the full moon was spectacular in the clear, star-studded sky as we sat silently around the warmth of the campfire. The rippling water upon the lake’s surface at the far cove sparkled like a mass of fireflies, its concentration spreading in a v-shaped formation towards us. It was impossible to take our eyes away from this brilliant performance. We settled in by 9:30 pm after an enduring day.